Well, for the most part, I am moved. I'm slowly adjusting to my new cave, this one's actually got windows and I'm on the second floor. So, that works for me. It's not easy living with 13 - 14 other people... let alone all of them men. However, I do have MANY bladed weapons that say "Not on my watch". So I'm "safe". I'm hoping one of these jobs pans out that I've been applying for. I really would have liked to have gotten my mom a functioning tv and vcr / dvd for Yule. That way, she could watch her movies and what not with ease. Not to mention those folks who've been REALLY good to me. Something a little nicer than a card would have been my gift. As it stands... Blessed Yule to you and yours. That's about the best I can do. I love you guys, you've been great to me. You've balanced me out when I've needed it, and you've cheered me up when I'm blue. You've taken a lot of crap from me over time, and not complained too much. May this holiday find you and yours well, and may the upcoming year be smooth sailing and your troubles far and few between. So here I am, thinking I just blew out the throw out bearing on my truck's transmission and I'm right in the middle of a MOVE!!!!! Come to find out... it was just the high beams for the headlights. *phew* I flipped for a moment. I don't have another vehicle to move with (my Grand Am's too small and not legal anyway). So, for right now... all is well on that. I'll update a bit more tonight after I think some stuff through. Okay, so I didn't quite get to it later that day *grins* My brother called me up to watch "March of the Penguins" with him and the family, so I went. I need some time to think... so I'll post the conclusion of the other post later. So today, I went out with a good friend of mine and her family to see "Harry Potter and The Goblet of Fire". The movie was pretty good, the company, even better. Granted, it wasn't the best start of the day... talk about mood swings. I've seen less swings at a playground. A lot of it is the whole job / moving situation for me. I wouldn't say I'm happy where I'm at, because I'm not. But at the same time, I don't relish moving. I'm not in the military, I shouldn't have to be moving this often! But as the day wore on, it definitely improved. Knocked the shelf down above the toilet. But I hung it back up, so all was well there. On the way home from the movie, we stopped at Wendy's for a burger and just some time to talk and reminice about the fun I'd had as a driver with the people that I was taking home from work. To this date: There is still that loyalty there for these folks. If anyone of them asked me for something, and it was within my power to give, absolutely I would do it. I just looked at my watch and it's almost 0300MDT. It's 0242 and I can feel my eye lids starting to slam shut. I'm tired, so I will get up and work on this later today. Almost said tomorrow *lol* This is one of those "deep" subjects. You know... a well!! After the untimely passing of Eddie Guerrero, WWE and the entire sports-entertainment community is still reeling from the devastating loss of a champion. The initial autopsy reports on Guerrero have come in. WWE.com spoke with Eddie’s widow, Vickie Guerrero, earlier today. “It was heart failure. It was from his past – the drinking and the drug abuse. They found signs of heart disease. She (the examiner) said that the blood vessels were very worn and narrow, and that just showed all the abuse from the scheduling of work and his past. And Eddie just worked out like crazy all the time. It made his heart grow bigger and work harder and the vessels were getting smaller, and that’s what caused the heart failure. He went into a deep sleep. As soon as they saw his heart, they saw the lining of his heart already had the heart disease. There was no trauma, and Eddie hadn’t hurt himself in any way. It answered a lot of questions. I knew Eddie wasn’t feeling very good for the last week. He was home and kept saying he wasn’t feeling good and we thought it was just “road tired.” So we thought he just had to rest. It answered a lot of my questions, too, because he was just so exhausted. She said it was normal because the heart was working so hard. When he didn’t call me last night and the night before I knew it was for real, because he would call me every night. I miss his phone calls. I cried through the whole thing (last night). I loved his laugh. His laugh was the best. I’m just overwhelmed by how people are coming out. It’s touched my heart a lot. Everybody was just in awe last night in how beautifully everything was put together. Introduced the steel chair, when the ref started to "come around". Eddie'd whacked it on the ring mat and then tossed it at Kennedy, falling over as if he'd been hit. Kennedy was disqualified and then turned around and blasted Eddie in the head. The assault was quick and violent and I was wondering if perhaps that blow had caused some serious after effects. There are those of you out there who say wrestling's fake. Some of it is, yes. Including a lot of the chair shots, but I was wondering if Eddie had managed to not get his hand / forearm up between his head and the chair before impact. It was that fast. Fortunately, that was not the case. Unfortunately, it was Eddie's heart that gave out. I had taped Monday Night RAW and watched a touching tribute from men such as Vince MacMahon, Chris Beniot, Triple H, Chavo Guerrero, Dave Batista, et al. I'd watched grown men cry at the tribute to one of their own and I was touched. To the Guerrero / WWE Families: My deepest condolences on the loss of Eddie. He Lied / Cheated / Stole his way into my heart. Viva La Raza! Eddie Guerrero. I will miss Latino Heat on Friday Night Smackdown! That was something that we heard coming from our television sets every Friday Night (formerly Thursday Night) from WWE's Smackdown! Tonight, it is my sad duty to write of the passing of Eddie "Latino Heat" Guerrero. He died in Minneapolis, Minnesota on November 12 / 13, 2005. As of yet, the cause of death is unknown as he was found in his hotel room Sunday morning. Many of you may know Eddie Guerrero from when he came up with Dean Malenko, Chris Beniot, and Perry Saturn as 1/4 of The Radicalz. A lot of us know him as Latino Heat and his nephew Chavo Guerrero (Kerwin White / Monday Night RAW). Eddie has had a sordid life: Battling drug addiction(s), trouble with the law, and so on down the line. However, he managed to get himself cleaned up and started to wrestle, coming from a long line of wrestlers in the Guerrero family. He was recently considered a "heel" and picked on Rey Mysterio, saying that he was Dominic's father, and battling Rey Rey on many occassions, losing matches to the smaller man. Eddie will be remembered for his HAWT low-riders, that made a come-back recently with the urgings from Champion Dave Batista (thanks Batista, I missed the cars). 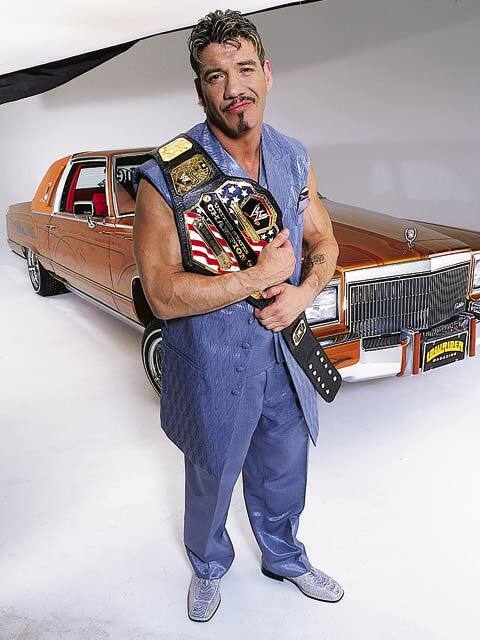 RIP: Eddie "Latino Heat" Guerrero 1967 - 2005. VIVA LA RAZA!!!!!!!! So my mom and I were discussing children one day and I'd asked her exactly how late / early was I born. I was SUPPOSED to be an early October baby. So.... I decided to be a weasel and was born November 14, 1974. My brother was SUPPOSED to be like around the end of the year. He turned up in February of 1978. I can't help but to wonder if doctors were off because of the fact that this was back in the 70s and they didn't have the technology then that they do now. Of course... this is why they call it PRACTICING medicine... they're still trying to get it right. Anyway... happy birthday to me... and I got hit on while at the gas station by this guy that I'd never SEEN BEFORE TODAY!!! Oh where do I begin? I'm in debt up to my eyeballs, I'm not having any luck finding a job. I've turned in applications and I don't hear back from prospective employers. I call and "so and so isn't here, may I take a message?" and still no word... and no work. I'm gonna go take a hot shower, turn in another application and go from there. Maybe pick up a greasy burger on the way home and write more later. Okay. I just don't get it. Why are some people so hell bent on trying to "save my soul"? I am Wiccan. I'm leaning towards the Celtic aspect of it, but Wiccan none-the-less. I'm still "in the broom closet" to my family and most of the people I know. That's cool about the latter. Most of the people I associate with (or did) are LDS and they work up at the LDS Church Office Building here in Downtown Salt Lake. So no worries there, really. If it ever came up in casual conversation, I'm sure I'd tell them without reservations. I bring this up because I'm a regular at a site Let's Roll 911. There's an individual there who seems bent on telling me that because I am Wiccan, that I am unhappy, misguided, et al because I do not believe in his "God". It's getting to the point where I'm ready to say, screw it, I've got better things to do with my life. Let the world destroy itself, then there's nothing to worry about. *sighs* I just don't know. Pissed off would be more like it. I know I've been behind in my Blog Writing, but it seems as nothing's going right in my life at the moment. I called my step-dad's folks up today to see what's what. KapnKent's mom informed me that he was in the Grey Bar Hotel (county lock-up). Since he'd been fired from his job he hasn't been working. Not long after he'd lost his job... his dad had fallen and broken his hip and his leg in 2 places. So, KapnKent'd been helping to take care of him all this time. Think the State cares bout that? NOPE. So... the plan right now is out on the 15th November and within 30 days, getting a job. As for me... my court date is Monday at 0830 and hopefully... we won't be bunkies. Not exactly doing this as an every day project... just when the mood strikes me. Sometime next month, the IKV Laughing Mink will have its very first meeting. I say cool. I'll post again after I find my back scratcher, or piss my cat off enough he'll do it for me. Holy hell Batman. I only got a couple of hours of sleep last night and I have no idea what I'm going to do with myself today. I have a meeting at 10 am that will last about 2 hours (I HOPE) and then a BBQ / Meeting later at 1530. I got up around 4am to use the restroom, and that was all she wrote. I was up for the remainder of the time after that. Guess I got a lot to think about. Star Trek Fan Clubs are not just "nerds" or "losers" who don't have a grip on reality. It's basically a group of people who have a common interest, Star Trek, and they get together to either discuss the show, or do things like charity projects. For a while, I was invovled with a couple of other groups before striking out on my own as it were. Mink don't smell all that great. Klingons don't shower..... often. Mink aren't exactly... user friendly. While they won't attack you outright, piss one off and you'll have to remove furry little claws and teeth from various parts of your body. They can do damage. If nothing else, the captain is deceptive looking enough: Short, human, female who has all the temperments of a Klingon. So, as I get all of this up and going, I guess I have a lot on my mind to keep track of. This should be .... fun *grins*. Well, I'm not quite sure what to think specifically about all that's been happening. Today has definitely been a Monday for some of my friends. Well, yesterday, since right now, it's 0320 on Tuesday morning. I'll add more thoughts after bed. Phew. I'm wondering if I'll be able to survive all the mess that I'm going through right now. I know someone's "balancing the Karmic Books of Justice", but I'm tryin to figure out what it is that I did so wrong to get the snot knocked out of me every time I turn around. I need to get some stuff mailed off, and hopefully that will help me out. I'm gonna take a couple of days and leave town though.... that way I can get my head screwed on. Well, this is my first ever blog. Never thought I'd get into it, but after reading some stuff on another site, I decided to create it for myself.